[ iNCHEON ] Airport is actually on a land-fill formed from THREE islands off the port of inCheon, South Korea’s most North-Western city . it is an hour’s drive by car on the highway from the Capital of SEOUL, two during traffic hours . first-off : inCheon is uncomparable in scale with other airports, intact with movie theatre and a skating rink at the central parking ground floor . aside from the Airport there are other grouped areas on the island, where subway stops but better accessible by encircling bus line : hotel area, postage area and apartment complex housing those who work at the airport . City Airport Terminal at COEX Exhibition Complex would only be convenient if you have business in the Southern area of the Capital, with limousine buses 1 ~ 1.5 hours away . taxi though NOT advised would cost you around W60,000 including toll fee plus out-of-town surcharge . [ GIMPO ] Airport is the domestic airport serving the Capital of SEOUL with flights to selective cities in neighboring Japan, Taiwan and China . it is on the Western out-skirts of metropolitan SEOUL, meaning an hour’s drive to central downtown . if you have a choice, it would be wise to take a flight into this airport since it is considerably easier and quicker than inCheon, to get into SEOUL . and although it still considerably smaller than inCheon, it is now a shopping complex with two deluxe hotels AND two express train/subway lines . taxi to downtown SEOUL would cost roughly W20,000 and advised if you have luggage, since hotel buses don’t come here as in inCheon AND train/subway station is quite a walk . [ GWANGJU ] Airport is at the South-West corner of the city, thus is actually IN GwangJu . it is joyfully sandwiched a subway station each between KTX Bullet Train Station to the West, and KDJ (Kim DaeJung) Exhibition Center to the East . [ GIMHAE ] Airport is just across the river from the West-end of the city . GimHae is actually the name of the town lying just North of the Airport, with a large furniture outlet hill further North-West . no subway access, but is connect with hotel limousine buses, and take well less than an hour to reach the furthest East across town, to BEXCO Exhibition Center and Summer beach of HaeUnDae – travel time is at the mercy of bottle-neck on the rather short over-head highway linking West-side with downtown . 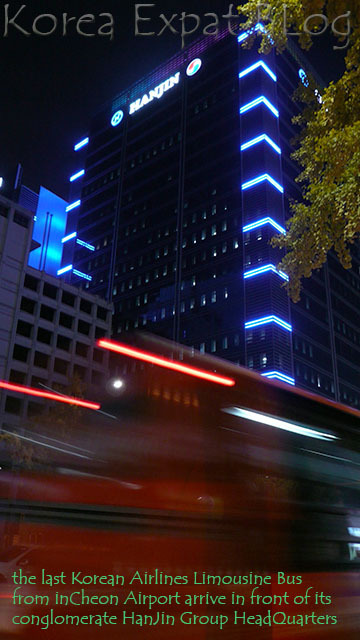 KTX Bullet Train Station is in the middle of downtown Busan – aproximately 40 minutes by taxi from the Airport .